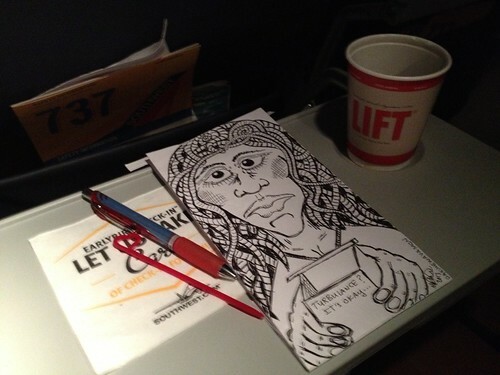 Moleskine Exchange: Barf bag art on Southwest Airlines! Barf bag art on Southwest Airlines! Barf bag art on Southwest Airlines!, a photo by Mike "Dakinewavamon" Kline on Flickr. The Southwest Flight Attendants from LAX to ABQ were awesome. They checked out the Moleskine I am completing from round three (blank pages). One of the attendants named Katie asked if she could have this one as I was leaving it in the seat pocket, so I agreed. The start to a good day! Round 4 and a bit of renewed optimism. Where oh where can my Moley be????? ?